World War II has left the world in upheaval, and many nations' futures are filled with uncertainty. The USA and the USSR are the only Superpowers who can lead the world toward a better future. Cold War: CIA vs. KGB puts you in charge of a spy network during the post-war era. Your purpose: to "persuade" foreign governments to embrace the "proper" ideology, by any means necessary. Manipulate local factions of influence to get your coup d'etat up and running. Double-cross and eliminate your opponent's leaders. Gain prestige for your side by winning the Space Race, dominating the Olympic Games, or ensuring that one of your countrymen wins the Nobel Peace Prize. In this decades-long conflict, victory will go to the side with the resources, conviction, and commitment necessary to ensure that their world view shapes the future. I was introduced to this game by my friend Chris while we were waiting for a friend to arrive to game night at the Dice Dojo in Chicago one night. He said it was quick and fun and is a great way to spend a half hour (although it can be longer if the game is close). This game is simple straight out of the box, read the rules in five minutes and start playing kind of game. Each player takes the role of either the CIA or KGB, hence the name of the game. Both sides are identical and the only difference is the art on the agent cards. Each round of the game will pit the two sides against each other to gain control of a region of the world with varying point values. Some being ten points and ranging up, I know that Egypt is a high point value for example. After seeing what the goal is for the round each player secretly picks an agent from their pool of active ones to send on the mission. There is Double Agent, Master Spy, Assassin and more each with their own ability based on whether you win the region or lose the region. For example if you win the region with the Assassin then you effectively kill the other persons agent. Another example that can be fun is is you lose the region but have played Master Spy then you still win the region, always a fun bit of trickery to play on someone when they think they’ve won. In each game round once you’ve chosen an agent, and kept it secret, play revolves around enlisting various groups (Military, Media etc) till you have reached the number listed on the contested country. There is always a limit to the number of group cards you can play. The four type of group cards have abilities, all the same between the four groups, although each card has its own value that when grouped together add up towards the contested regions total for the win. If you exceed the total then the region is in Chaos and you might kill your agent. Without going into more detail about the game play, I feel as though this is a simple game once you learn it and has a lot of strategy. The game play is more about knowing your opponent and trying to put up a good poker face and be unpredictable in the agent you choose. This is always a great quick game to play with a friend prior to playing something bigger. I highly recommend. 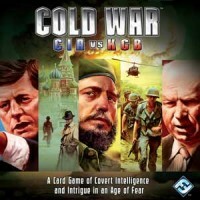 Add a Review for "Cold War: CIA vs KGB"